Last night I went to the Haunted Stereo curates the Hamptons, my first proper Sotones event, and was pretty impressed! 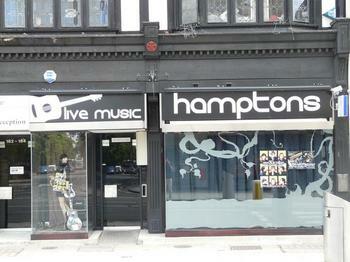 I wondered how a place that, lets be fair, is as small as the Hamptons could hold such events, but I was wrong to doubt it! It wasn’t cramped, but there were plenty of people there. My favorite band of the evening (no offense to the others) had to be the Little Philistines. Having not had time to see Moneytree (which is actually such a shame) Little Philistines were a good substitute! Their whole set full of surprises, including one of the guitarists pulling out a trumpet mid song. And, I was lucky enough to get the last of their free CDs, which i will enjoy soon enough! Saying that, the other bands were good! So Say So and Not Made In China certainly got the crowd tapping their feet! Good choices from Haunted Stereo, really. Of course headliners Moneytree, I’m sure were brilliant, but this isn’t first hand information, so don’t quote me on that. But how could they not have been?? Anyway, I really hope none of you are reading this the day that I have written it, because really, you should all be at the Hamptons for the second night of the Haunted Stereo Curates weekend. With headliner Peter Lyons and an array of other acts. And Its Free! So you actually have no excuse not to be there. Until next time, Sam the Intern!